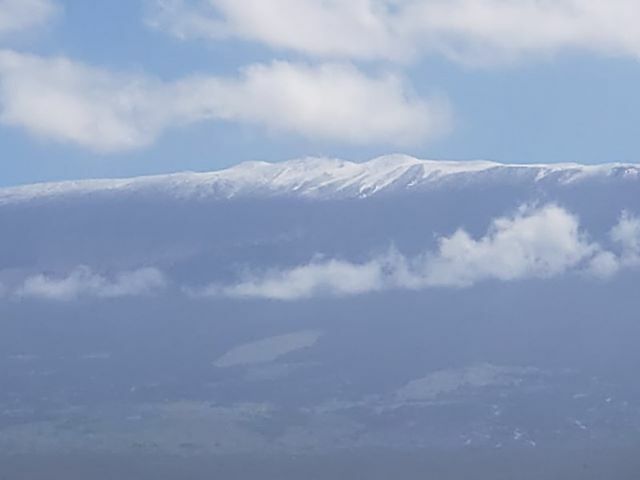 Snow at Haleakalā 2.11.19. vantage from Makawao. PC: Jennifer Driggers. The Summit District of Haleakalā National Park will remain closed – sunrise included- through Friday, Feb. 15, 2019. The National Park Service continues to be in close communications with the National Weather Service which is predicting continued cold temperatures and precipitation at the summit. These conditions are resulting in extremely dangerous driving conditions. “We look forward to welcoming visitors back up here when the weather warms and conditions are safe,” said Superintendent Natalie Gates. The Kīpahulu District of Haleakalā National Park remains open as well as the Kīpahulu Campground and The Pools of ʻOheʻo. The pools may close without notice due to flash flooding. A February 10 winter storm left snow and ice on the Summit District roads, as well as fallen trees and loose rocks. Rangers are enforcing the park closure at the Summit District entrance (6500 ft elevation) to protect visitor safety. A Winter Storm Warning remains in effect for the summit of Haleakalā on Maui until 6 p.m. on Thursday. The National Weather Service says periods of freezing rain and snow are forecast with around 1 inch of snow, and ice accumulations of over 1/4 inch expected. 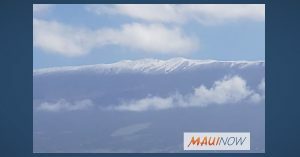 NWS forecasters say very cold air aloft will move over the islands with showers spreading over the highest peaks of Maui and the Big Island through tomorrow. Temperatures will warm up over Maui by Thursday night with snow transitioning into rain over Haleakalā.